iSkip.com is the home of the worldwide skipping movement. We celebrate all things skipping. 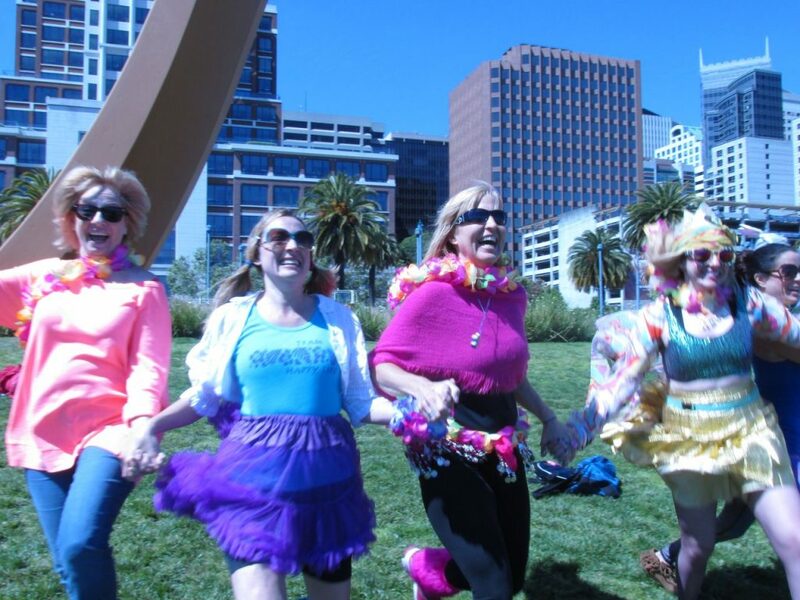 San Francisco’s Kim “Skipper” Corbin created iSkip in the spring of 1999 when she became so inspired after skipping for the first time as an adult that she decided to invite the rest of the world to join her. That set off an unprecedented flurry of national media attention: Time, Newsweek, People, USA Today, the BBC, CNN, and more all did stories about Kim’s efforts. She even got to skip and hold hands with Donny Osmond on national TV. As skippers from around the world heard the news and began contacting Kim, she quickly realized she was not alone in her love for skipping. Free spirits from all walks of life and in all shapes and sizes began contacting her through the website. Some had been skipping for years. Others were just finding the courage to give it a go again as adults. Much to Kim’s surprise, the fitness community also took her idea quite seriously. Shape, Fitness, and Sports Illustrated for Women all told the story. Prevention Magazine researched skipping and wrote a highly favorable article about the benefits of adding a skip to our steps. There’s no doubt about it — skipping is good for the body, mind, and soul! Consumed by her passion for skipping, Corbin quit her corporate job in January 2000 to pursue her dream full time. She poured her heart and soul into her vision, recruited head skippers in as many as 60 cities, and attempted to start a writing and speaking career. Unfortunately, that didn’t go so well. Corbin ultimately skipped herself into financial ruin, and would spend the next several years going through what she calls the “post acute skipping hangover” phase of her journey. But as soon as she’d think her skipping path had come to an end, a newly inspired Skipper offering a unique contribution to the skipping world would skip onto the scene. Ashrita Furman established himself as the fastest skipper in the world by setting Guinness records for the fastest times in a 5K and a marathon. The skipping story refused to let Corbin go. So even though she wasn’t skipping as unabashedly as she once had, she turned her focus to writing about and celebrating the skipping efforts of others instead. In 2012, Corbin started skipping on a daily basis again after connecting with Bill Martinelli, who had skipped a path almost identical to her own in the 80s, but had hung up his public skipping shoes long before. His passion for skipping on the YouTube video of him that went viral was like a spark that rekindled her own conviction that the world would be a happier place if more people skipped. In 2013, a young, visionary skipper in New York City named Michelle Joni of Michelle Joni’s Skipping Club fame took everything up a notch when she gracefully bounced and twirled her way onto the national skipping scene. Two filmmakers at a company called Unlikely Hero Productions also started work on a skipping documentary called Skipping Joy that sets out to discover who we were before the world told us who to be. In April 2014, iSkip celebrated our 15th birthday by working with a skipper named Alison Chapot to create a Skipalong for Hopalong fundraising event and Kim created a fun 21-Day Skipping Experiment as a way to inspire more people to give a skipping practice a try. The skip goes on and it’s exciting to imagine where our collective skipping adventure might take us next…and we invite YOU to be a part of it! So please sign up for our mailing list using the from on our home page, like us on Facebook, and/or better yet, send us an email or YouTube video that tells us what you love about skipping, As always, fun ideas for how we might be able to collaborate with you to share the joy of skipping with as many people in your community as possible are welcome too. And if you include your mailing address w/ your skipping story email, we’ll even send you an I LOVE SKIPPING bumper sticker in the mail for FREE! Hope to hear from…and skip with..you soon! Skip on! Love the movement. Love the energy!